Who doesn´t want to have “more energy”? That´s why we consume caffeine, power drinks and even drugs. We don´t need more physical energy, however. 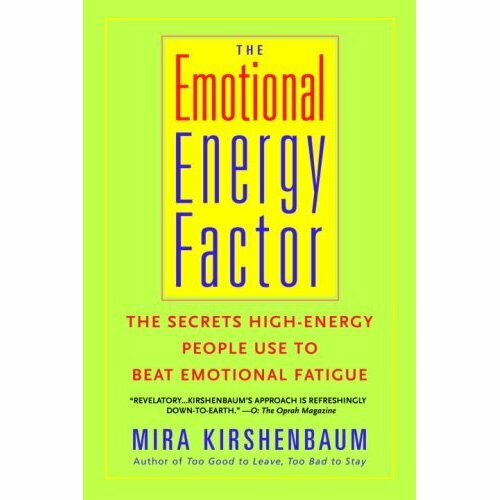 We need more emotional energy. Emotional fatigue can keep you from living a full life, and yet a lot of us have suffered or suffer from it to a certain degree. The first step to overcome emotional fatigue is to recognize and acknowledge it. Worry, anger, envy, unresolved business, mental and physical clutter and toxic interactions are just some of the culprits. 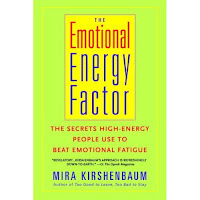 The solution to emotional fatigue is not eliminating problems – they will always arise in one form or another – but facing them and solving them. A bad marriage, a layoff, an endless to-do list, an illness, can all trigger emotional fatigue. So can daily irritations if we let them build up without an appropriate outlet. Performing an act of kindness, practicing a sport, creating art, enjoying the company of uplifting friends and playing with your children can increase your emotional energy. Take care of your appearance. Knowing you look good makes you feel good! Eliminate clutter from your home, your closet and your mind. Throw or give away what you no longer need. Take yourself, and life, with a grain – or many – of salt. We are all going to die in the end, you know! But … don´t drain yourself by worrying about that too! Live by Reasons, Not Excuses! Who hasn’t made excuses for not doing something we really want or need to do? If we wait for the perfect time to have a baby, to get married, to get divorced, to take up a sport, to write a book, go back to school, move, take up painting, dancing, photography or whatever it is we want to do, the perfect time will never come. Life always gets in the way, and that’s a good thing. It means we’re alive. Why not rephrase each excuse and turn it into a reason? What excuses do you give yourself, and how can you rephrase them into reasons? 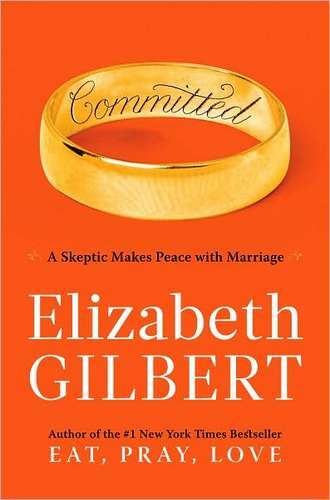 I checked out Committed by Elizabeth Gilbert – author of Eat, Pray, Love, out of curiosity. I’d listened to her first book at a timely moment in my life. It was a Godsend. What I found in Committed were countless paragraphs that I wanted to underline (but couldn’t since the book belongs to the library) because they hit home. I recommend the book to any woman who is haunted by her exes, who hates them or loves them, who is in love again or wants to be or doesn’t want to be, who is divorced, married, single, widowed, dating, sworn off men, young, old, a mom, a non-mom. I recommend it to any woman who wonders what makes a marriage successful, or if it is even healthy to marry, to divorce or all of the above. That may very well be all women. “Part of what makes the experience of divorce so dreadful is the emotional ambivalence. It can be difficult, if not impossible, for many divorced people ever to rest in a state of pure grief, pure anger or pure relief when it comes to feelings about one’s ex spouse. Instead, the emotions often remain mixed up together in an uncomfortably raw stew of contradictions for many years,” states Gilbert. Finally, someone owns up to this publicly. If you have kids, then this is compounded because you have to somehow interact with that person with whom you have so many unresolved issues. And, unresolved they may be forever. It might be a matter of learning to live with it and using that experience towards your next relationship. She also reminds us that the person we choose (and hopefully chooses us) as a partner at different times in our life defines who we are at that moment. Both people are in it, and no manner of one-sided finger pointing will change that. It’s not easy to acknowledge, but I can relate to it. Gilbert mentions a study by the naturalist William Jordan, Divorce Among the Gulls, where he explains that seagulls – a species that mate for life – have a 25% “divorce rate”. Sometimes two seagulls just don’t get along. They bicker and complain and don’t communicate. After a couple of seasons of this, they go off and find other “spouses”. This is enlightening, and explains why some people have grand relationships with one particular person but strife-ridden relationships with someone else and yet they are – in essence – the same person. Mix oil and water as vigorously as you want, and you get nothing but oil and water, separated. Mix oil and an egg yolk, beating it smoothly and continuously and presto: mayonnaise! Of course, mayonnaise can also separate if it spoils. But, there are ways to prevent that. 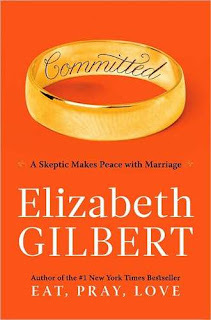 Gilbert wrote Committed when she and the love of her life found they had to marry so he would not be deported. The glitch was that they had promised each other not to marry – ever - after having both experienced shattering divorces. She then decided to study the institution of marriage and the ins and outs of commitment, of infatuation, of maturity, of compatibility, of loving someone because of who they are and not because of who you would like them to be. There is no tidy conclusion to it, as there is no tidy conclusion to relationships or even life. I enjoyed it. A lot. Now I’m going to buy my own copy, so I can highlight the heck out of it. Wacky Cookies - A Creative Woman´s Solution to the Financial Bust! Have you ever been instantly drawn to a stranger in the midst of a crowd? That´s how I felt towards Aymee Van Dyke (neé Rodriguez) when I met her at a networking event three years ago when she was promoting her personal development biz. She has great energy and many virtues and talents – too many to fit into a blog post – but in this entry I´ll focus on her Wacky Cookies venture. Aymee makes beautiful and mouth-watering cookies that are more than that … they are a gourmet experience. 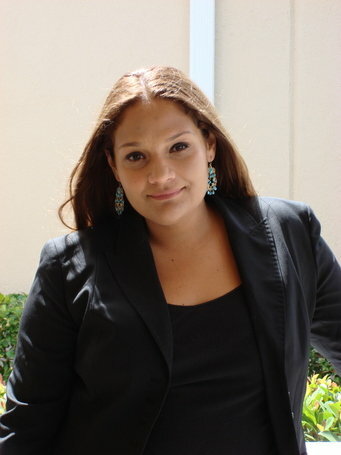 Aymee was – as many of us – hit by the financial bust. That’s when she launched her cookie business. Read on if you want to be inspired! LCL.- When and how did you start Wacky Cookies? AVD.- I started Wacky Cookies from my home in 2008. My Personal Development business was in a slump. The economy ripped and people were no longer investing in themselves... I had started baking when I was 3, flouring pans for my mom who was a cake designer and owned a restaurant and catering business, and saw that there was a renaissance of comfort food due to the situation with the economy. I started by making a batch of cookie pops… My mom used to make those and I loved them as a kid. LCL.- What sets you aside from other Cookie ventures? 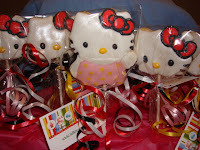 My kids´ favorite Wacky Cookies! AVD.- We bake everything fresh to order.. I mean we even hand mix the cookie dough.. And cut each cookie by hand.. Nothing is produced by a machine. Everything is 100% fresh. Our icings are mixed with nothing but the best and kosher ingredients. I don’t use vegetable shortenings or any of that artificial stuff that is normally in cookies, no artificial preservatives. I figure if you are going to have something decadent, it might as well be the best... I customize cookies. You can call me and I can have a cookie cutter made for a special occasion and we can customize everything from the taste, to the color to your name. We are an Internet-based business (closed bakery/no storefront) which allows me more time to personalize our service, instead of having to constantly "drop" what we are doing to rush to the front of the shop and take care of people who come in. We deliver cake and cookies to you! No hassles with picking stuff up. We bring it to your doorstep. LCL.- What is your definition of Success? AVD.- My definition of success is doing what you love to do all day, every day and being paid for it...That is the ultimate success! 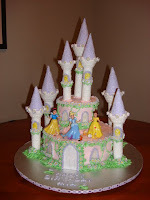 My greatest achievement was when I went out of my comfort zone to make a last minute princess castle for a 4-year-old little girl. She loved it! The sugar work took me two days (which is actually not that long in the cake business) but it was just beautiful. When we delivered it to her hotel, everyone in the lobby gasped that was a great moment for me. Very humbling. My biggest goals for the future: I have to say I would LOVE to become the Sylvia Weinstock of cookies. She is considered the Da Vinci of cakes, and well, she is just a remarkable cake designer. As a cookie designer I am always trying to learn new techniques and my biggest desire is to continue to grow and develop my skills as a sugar artist. There is so much room for innovation in this field. I want to take cookies to a whole new level. A cookie, as an edible piece of art can make a happy occasion into an amazing one. It can also transform a person’s mood if they are having a particularly bad day. 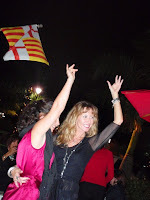 Having been born in Spain and living in Florida, I yearn for a place where I can meet with friends, eat paella, gazpacho, Serrano ham and drink a good Spanish wine indoors or out on the patio. In Naples, Florida, there is such a place. Its name is Café Barcelona and the owners Pedro Casoliba and Montse Bonache, have withstood the recession thanks to their Mediterranean cuisine. Over twenty restaurants have closed in the coastal town of Naples, Florida, in the Gulf of Mexico in the last year. 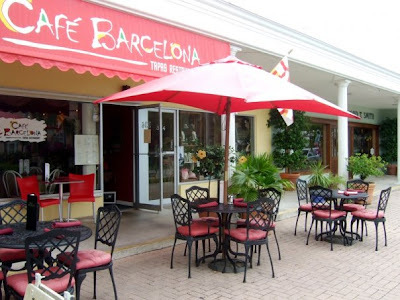 Café Barcelona, however, that opened its doors in 2005 is still standing, and always offering tasty and affordable menus. It is where Spaniards and everyone else who enjoys tapas, comes to celebrate anything from New Year’s Eve to the simple fact of being able to chat with friends while drinking sangria and dancing Sevillanas. There is now a $29.00 meal for two that includes a free bottle of wine, that you can enjoy al fresco, while listening to the strumming of a Spanish guitar. Montse and Pedro are veterans in the restaurant business. They started out in their native Barcelona and later on they had businesses in Costa Rica and the Dominican Republic, which catered to the palates of patrons who enjoy exquisite Spanish tapas. Success is standing strong during and after a recession, adapting to change and always offering reasonable options for the most discerning diners. Follow Café Barcelona on Facebook. What to do When You´re Feeling "Off"
Some days, you’re just “off”. It happens to me and in fact, it happened today. Despite being a fan of positivity and being proactive, some days I´m just not feelin´ it, and there’s nothing wrong with that. I’m so used to setting priorities, organizing my projects and taking the steps required to achieve a goal, that when I have a blah day I feel a little embarrassed to admit it, even to myself! Jet-lagged and a tad overwhelmed by maternal, domestic and professional responsibilities, today I felt out of sorts. At a certain point I resolved to do what I recommend to others when they tell me they’re having an “off” day: accept it! From that point on, I found it easier to cope with. I suggest that if you have a day or even a week when you are out of sorts, you be nice to yourself. If you are usually a doer, that is not going to change. Don’t flagellate yourself. Be reminded of your virtues, the good things in life and accept that you cannot be 100% all of the time and that’s not a failure. Just like the tide, our mood and our energy ebb and flow. On the other hand, if we did not have moments of apathy, we wouldn’t recognize those in which we are focused, motivated and energetic.